Comedian and voice actor Harry Shearer has been stirring the pot in various ways over the last few years, from threatening to quit The Simpsons to filing a massive lawsuit for unpaid Spinal Tap merch money. There are only so many hours in the day, but the actor now has another project under his belt with a new sketch show. Called Too Soon?, the series will take a look at Donald Trump's presidency via weekly, half-hour episodes. 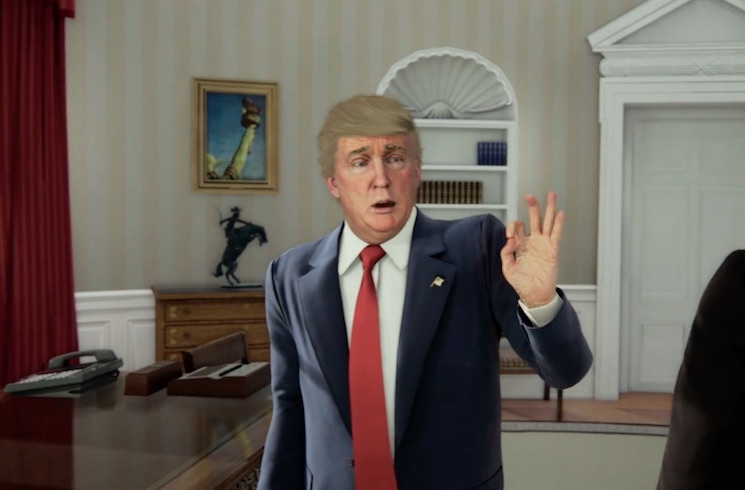 Uniquely, the show will be animated utilizing the Unreal Engine — the performance capture technology more commonly used for videogames. "I wanted to do this to start what I think is a future, if not the future, of topical sketch comedy," Shearer said in a statement. "With Donald Trump now set to be President, this could be comedy gold for the next four years." Watch a brief clip from Too Soon? below. If this things a success, maybe they can turn it into a videogame as well.